Her family gone missing, Maggie (AKA: Ford Falcon!) is on a quest to rescue them. Armed with a SpitStick, a ToothClub, an attack rooster named Hatchet, and the poems of Emily Dickinson, Maggie battles GreyDevils, Solar Bears, a pair of creepy goofball bad guys, and crazy corn that grows so fast it crackles. In the end, she turns to the truest weapons she possesses: her very own muscles, ingenuity, and razor-tongue wit. This wholly original tween novel combines a pause-register adventure, heartfelt family story, and triumphant journey of self-discovery. 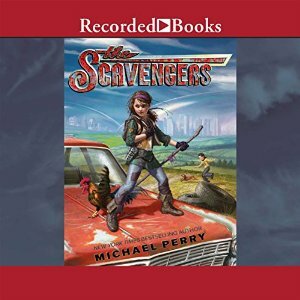 With Scavengers, Michael Perry achieves the perfect mix of humor and heart in a world where one person’s junk is another person’s key to survival.